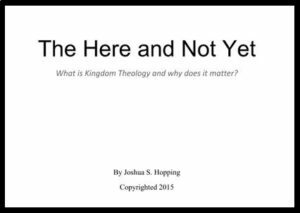 As it’s been a while since I’ve talked about it, I figured I own you all a quick update on my upcoming book, The Here and Not Yet: What is Kingdom Theology and why does it matter? The publication of the book has been pushed out a bit as the Vineyard International Publishing folks asked me to shorten the length a bit. Accordingly I am currently working on editing down the material (a process made slower by having to work on school papers). I have, thankfully, received some great feedback on the manuscript with two awesome theologians giving me suggestions to make it better (Dr. Peter Fitch @ St. Stephen University and Dr. Derek Morphew @ Vineyard Institute). A few local pastors have also written recommendations for the material. These I have posted below to whet your appetite for the book. What I love about Josh’s book is the way he melds powerful truth with an easy reading style. This makes the theology accessible to all without losing any of the impact of what it means to live “in the now, but not yet”. Historical truth, accurate theology and practical application makes this a handbook for people who want to “do” Christianity. –Kevin Thienes, Pastor of Prayer Ministries, Vineyard Christian Fellowship of Boise.